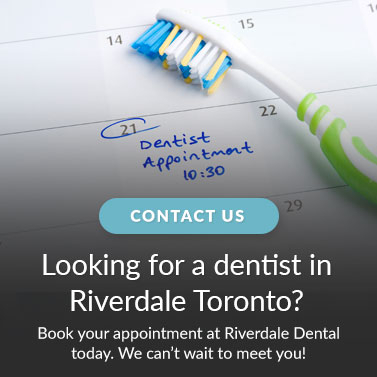 At Riverdale Dental in Toronto, we utilize the Periowave Diode Laser, a safe non-invasive tool which helps our staff identify the signs of tooth decay much earlier than other investigative methods. A Periowave Diode Laser works by shining a light onto the teeth through an optical fibre, ultimately distinguishing healthy teeth from unhealthy ones by the fluorescence level displayed on the reading. That means that we're able to begin treatment sooner, resulting in a better chance that the tooth will survive – without you having to go through more invasive dental procedures. Our staff is alerted to the early signs of decay both visually, as well as with an audible signal. Catching tooth decay early allows us closely monitor teeth that are more prone to decay, and put together a personalized treatment plan to return your teeth to their optimal health. Early tooth decay detection can eliminate the need for invasive treatment in the long run – that's especially important for our more anxious patients.